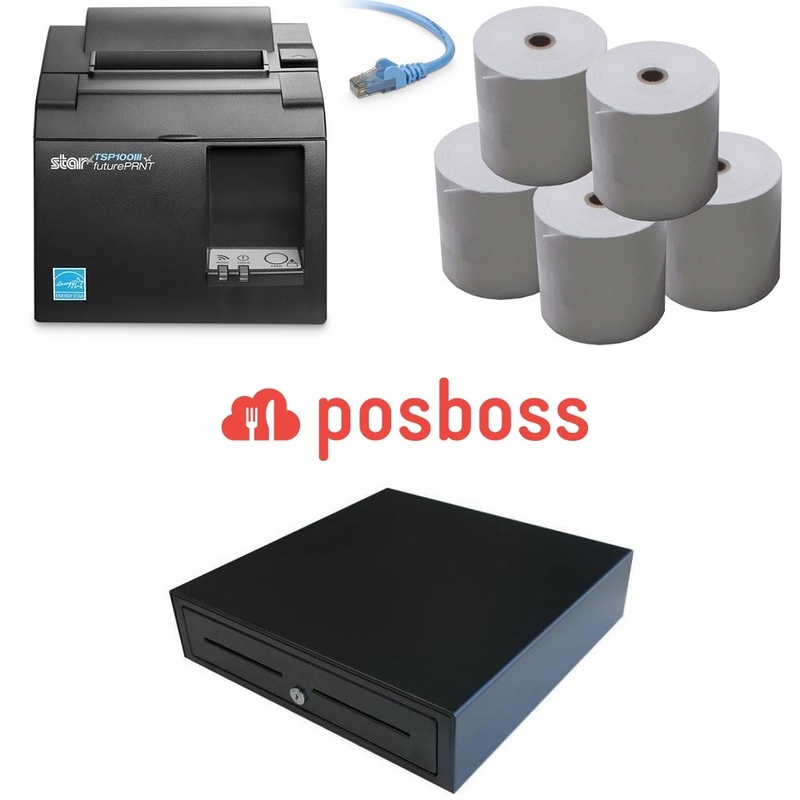 posBoss Point of Sale (POS) Hardware Bundle 1 is the cheapest bundle available for possBoss. 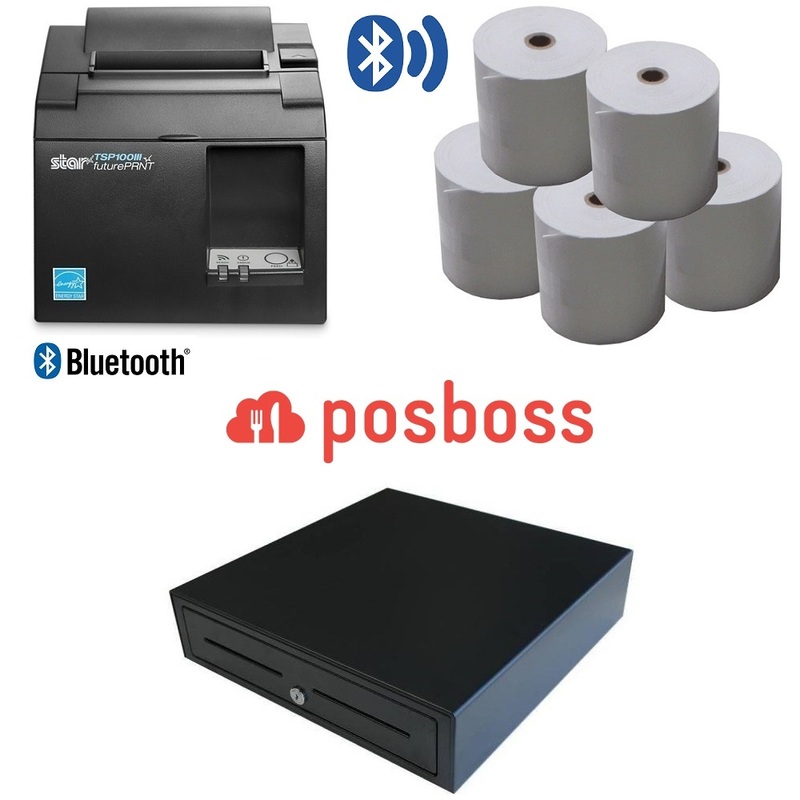 It includes the Epson TM-T82II Receipt Printer with Ethernet (LAN) Interface, Heavy Duty Cash Drawer and Box of 80x80 Thermal Receipt Rolls (24 Rolls). Compatible and supported by posBoss iPad POS Software, this Hardware bundle connects via cable to your Wireless Router / Model. You iPad will then communicate to the receipt printer across the network. The TM-T82II Ethernet POS Printer connects to the network or router using an Ethernet Cable (not included). Your iPad would in turn connect to the Wifi Router which places it on the same network as the printer giving them a connection. Once the connection has been established, you retrieve the IP Address from the Receipt Printer by pushing the soft button using a Pen on the interface board until it prints out the IP Address (If it prints "None", it has not been plugged into the correct port or there may be a network issue). You then enter the IP Address details into the Application printer settings along with the correct model being used. Epson's cost effective TM-T82II thermal receipt printer is built with the reliability, usability and functionality of Epson's industry leading TM-T88 series. The TM-T82II is the ideal choice for retailers with a low volume of POS transactions. Based on Epson?s advanced printing technology, it delivers the quality and reliability that Epson is known for, which ensures an easy, reliable printing solution for end users. The TM-T82II comes with everything you need in one box for quick setup and installation. The box includes manuals, drivers, utilities, cables, external power supply and easy-to-use software tools to speed set-up and installation. In addition, the TM-T82II is available with USB + Serial, USB + Parallel or Ethernet + USB interfaces.